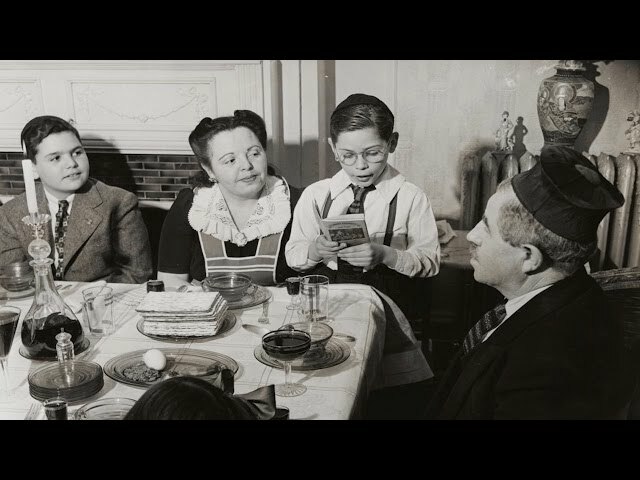 The Four Questions are featured prominently in most Passover Haggadahs and come early in the Maggid section of the Passover seder. They are traditionally recited or sung by the youngest person at the table. Find alternative and multilingual versions of The Four Questions here. מַה נִּשְׁתַּנָּה הַלַּיְלָה הַזֶּה מִכָּל הַלֵּילוֹת? שֶׁבְּכָל הַלֵּילוֹת אָנוּ אוֹכְלִין חָמֵץ וּמַצָּה, הַלַּיְלָה הַזֶּה – כֻּלּוֹ מַצָּה.שֶׁבְּכָל הַלֵּילוֹת אָנוּ אוֹכְלִין שְׁאָר יְרָקוֹת – הַלַּיְלָה הַזֶּה (כֻּלּוֹ) מָרוֹר. שֶׁבְּכָל הַלֵּילוֹת אֵין אָנוּ מַטְבִּילִין אֲפִילוּ פַּעַם אֶחָת – הַלַּיְלָה הַזֶּה שְׁתֵּי פְעָמִים. שֶׁבְּכָל הַלֵּילוֹת אָנוּ אוֹכְלִין בֵּין יוֹשְׁבִין וּבֵין מְסֻבִּין – הַלַּיְלָה הַזֶּה כֻּלָּנוּ מְסֻבִּין. Ma nishtanah halailah hazeh mikol haleilot? Sheb’khol haleilot anu okhlin hametz umatzah; halailah hazeh, kuloh matzah. Sheb’khol haleilot anu okhlin sh’ar y’rakot; halailah hazeh, maror. Sheb’khol haleilot ein anu matbilin afilu pa’am ehat; halailah hazeh, shtei f’amim. Sheb’khol haleilot anu okhlin bein yoshvin uvein m’subin; halailah hazeh, kulanu m’subin. On all other nights we eat leavened products and matzah, and on this night only matzah. On all other nights we eat all vegetables, and on this night only bitter herbs. On all other nights, we don’t dip our food even once, and on this night we dip twice. On all other nights we eat sitting or reclining, and on this night we only recline. Got kids? Check out this handy guide to teaching the Mah Nishtanah to children. Prep for Passover like a pro with this special email series. Click here to sign up and you’ll receive a series of helpful, informative, and beautiful emails that will help you get the most out of the holiday. Pronounced: khah-METZ or KHUH-metz, Origin: Hebrew, bread or any food that has been leavened or contains a leavening agent. Hametz is prohibited on Passover. Of blood, frogs, hail and more. Before launching into your seder, make sure you have everything you'll need. The most celebrated and beloved of Jewish home rituals.